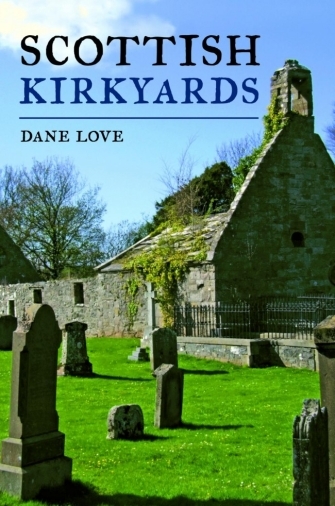 Scottish Kirkyards is available from the author's online Bookshop. The Scottish kirkyard has been vastly underrated as a place of historical importance, offering a wealth of information to the visitor or local historian. Within its confines can be found Pictish symbol stones, medieval sculpture, eighteenth century folk art and ruins of ancient kirk buildings. Here, Dane Love investigates kirkyards from all over Scotland and reveals the stories within them. The author examines the role of the kirkyard in the Scottish community, from being the parish market place where law-breakers were imprisoned in the 'jougs' to the days when the body-snatchers stole corpses and the more tranquil times when kirkyards became Victorian 'gardens of death'. He explains the meanings of carvings on the tombs, relates the traditional burial customs of Scotland, and, in a useful appendix, shows the visitor where to look for the graves of famous Scots. Scottish Kirkyards shows how the social history of an entire area can be compressed into a single plot of land.